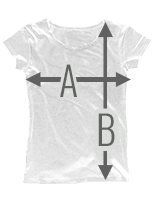 A shirt for the ladies who like it a little more simple. Small logo on the front and a big Sourkrauts lettering on the back. At the side seam there is of course as always the PVC logo.